Surprising to many, right underneath the Nusle Bridge and partly contained by the old city walls, is a beautifully landscaped park. 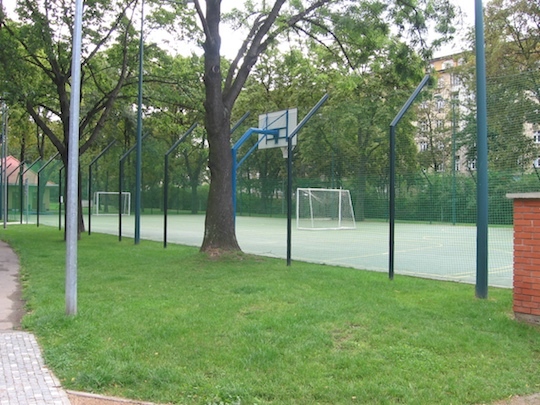 It offers two brand new playgrounds and free sports courts where you can kick around a football or shoot hoops with the kids. 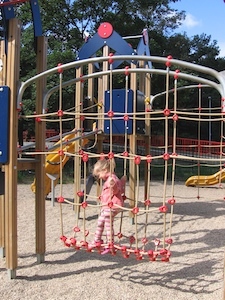 The playgrounds are fairly new and in great condition and are split into an older kids area (unfenced and closer to Nusle Bridge) and a younger kids part (which is fully fenced). Between them are the sports courts and a building containing a kiosk (this was closed when we visited but would be very handy when open) and toilets. 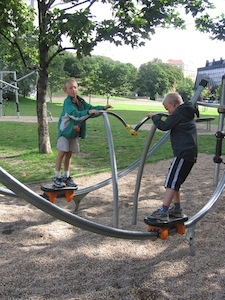 The older kids area has various climbing frames, skating boards on ramps and swings you can sit or stand on. 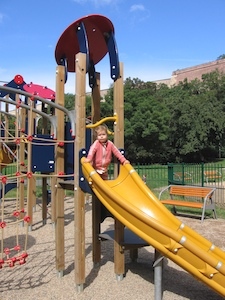 The younger kids area has some very small slides, rockers, a sandpit and swings for young walkers as well as larger climbing frames, slides and a zip line for older children. 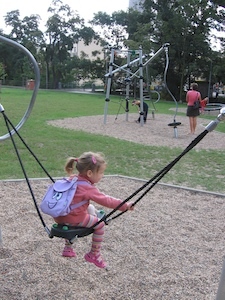 The park is beautifully restored and popular. I noticed parents out with prams taking a stroll, dog walkers and a comfortable amount of adults and kids in the playground. 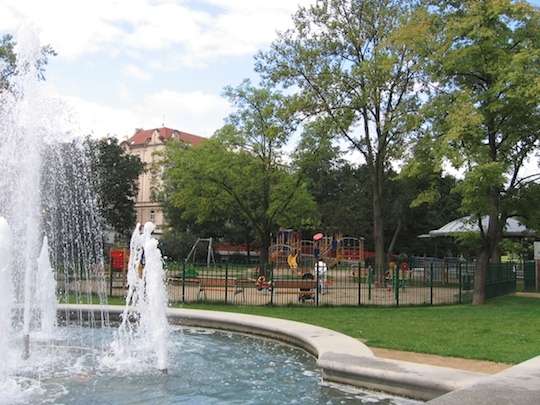 The park is partly bordered by Prague’s impressive old city walls and the Botic river runs right alongside it too. Adding to the beauty is a lively fountain that changes shape every few seconds and a water sculpture with bronze cast figures. The area is easily reached by tram or by foot from the river or Namesti Bratri Synku (just make sure to take a pram). DIRECTIONS: Take tram numbers 7, 18 or 24 to tram stop Ostrcilovo Namesti or Svatoplukova. If you wish to combine the outing with lunch then 3 or 4 tram stops further inland you will find Park Cafe.